Join the discussion on our forums! 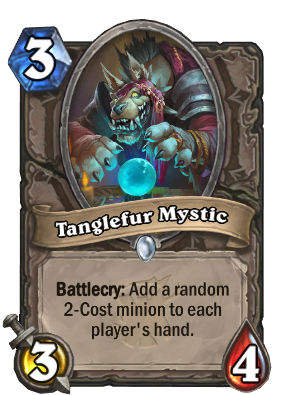 Come discuss Tanglefur Mystic over in our dedicated Tanglefur Mystic discussion topic. 2-Cost minion to each player's hand. Doom! Only doom for you! But pay good tip, maybe less doom. Sleeper card. 3 mana 3/4 statline is fine for an aggro deck, and as an aggro deck you are better prepared to make use of a 2 drop than your opponent. ... and make it double! I think this card was designed as a neutral filler for Odd decks. The idea is since you don't have any 2 or 4 cost minions, you can play this, and then play your 2-drop and use your upgraded hero power on the following turn. It makes the curve a little less awkward for these decks and has good stats for constructed. I see this being made for odd decks. why create this card? i know it has uses but why not a non random effect? Neutral Spellslinger, sort of, i like it. Always a good day when they add a new Gnoll minion to the game!